Walt Disney World opened in 1971, and for nearly twenty years it was the only destination theme park resort in Florida. While predated by Busch Gardens Tampa, that wasn't a park that visitors made a special trip to Florida to see. On the other hand, particularly once the second and third gate opened, Walt Disney World was a vacation itself, with tourists traveling to the sunshine state just to immerse themselves in the magic. In 1990, Universal Studios Florida opened their gates. Poised as a competitor to Disney, the park initially was a failure. However, they got back on their feet and began a process of rapid expansion. Within 10 years, the two park Universal Orlando Resort was no longer just somewhere to go for a day, but a viable add-on to a Disney vacation. It was almost always looked at as a secondary option, somewhere to spend a couple days at a lower rate to dodge some of the rising costs of Disney. However, in 2010, the Florida theme park market was forever changed by the arrival of a certain boy wizard. With the massive success of a single attraction, the entire industry has changed course. But is it for the better? Universal Orlando Resort...to many, the most dynamic place in the themed entertainment industry. To some, it has beaten Disney at their own game, with the most innovative and cutting edge attractions ever seen. To others, it is simply a place to go experience a slice of their favorite worlds of fantasy and sci-fi. To me, it was a little of both, but more than that it was home to the attractions that essentially got me into the theme park fandom. While I didn't become particularly active in the community until some time later, it was right around the turn of the millennium that I started to become interested in theme parks, and back then a little park called Islands of Adventure dominated much of the TV coverage (back then, the internet was much, much smaller). Due to the schedule for this trip, I ended up visiting the Universal Orlando Resort for the better part of four days (two full days, and two half days) scattered throughout. As a result, I opted to purchase an annual pass to the resort for this trip, as it was just $30 more than a two-day park-to-park ticket. Additionally, the group changed with each visit...Andrew, Brittney, Dan, Evan, and Sean all joined me for at least one day, and there was no day where I was completely alone (though I did go solo for a few hours of one). Thanks to this flexibility, there was almost no strategy associated with these parks...we just rode what we felt like, revisiting favorites, trying things we hadn't done yet, and consulting friends about what they'd like to do. As a result, this particular report is going to largely follow my first day at the resort (on which I was accompanied by Andrew and Brittney), but I'll throw in attractions we didn't do later where they make sense. While we generally didn't start our Universal days at opening, for my first day at the resort I insisted on it. Therefore, after a breakfast at IHOP we got to the resort a little before nine. I got my pass processed, then it was time to begin. So, which park to start at? Obviously, the first. While I only live about an hour from Universal Studios Hollywood, it is not a park I visit regularly. I do enjoy the park, but the revisit value is lower than anywhere else in So Cal except perhaps Legoland sans kids. With only about a dozen attractions, it is difficult to enjoy a full day there without running out of stuff to do. Harry Potter helped, but in my opinion USH is better termed an "8 hour park" than a "full day park." More than once, I've found myself simply re-riding the Lower Lot attractions to fill time until rush hour is somewhat clear. At Universal Studios Florida, this is not the case in any way, shape or form. The park itself has about twice as many attractions as the Hollywood park, and is easily a full day adventure for a first time visitor. Here, guests can ride through Gringotts with Harry Potter, aid Evac in protecting the Allspark from Megatron, tackle aliens in a job interview for the Men in Black, and escape from Imhotep on a runaway mine cart, among other highly themed immersive experiences. So, naturally, I went to the least "Universal" attraction first. Hollywood Rip, Ride, Rockit, a Maurer X-Car coaster, dominates the front of the park. The ride looks quite impressive, with a vertical chain lift hill, non-inverting loop, and a number of twists, turns, and hops above Production Central. Plus, the entire ride is set to a song of your choice. It looks like it should be a great coaster...but it isn't. Unfortunately, due largely to the train design, the ride is quite uncomfortable, with a lot of shaking and rattling as it rolls along the track. It isn't painful in the same way some older looping coasters can be, and it isn't bad per-se, but it should be far better than it is. Over four days, I only did three rides, despite never seeing a line longer than 20 minutes for it...that should say something about the quality of the coaster. After our ride, we headed down the street to Revenge of the Mummy. This attraction is one of a handful duplicated in California, but the two attractions are alike in name and ride system only. Florida's installation of the coaster not only features a much more elaborate queue and about twice as many dark ride elements as California's, but it is also a longer ride (though still a tad short) with a false ending featuring a really neat fire effect. My only negative about Florida's ride is that I prefer the storyline in California...there you're visiting an actual Egyptian tomb, not a movie set meant to replicate one. Other than that, Florida's ride is superior in every way, and actually wound up being my favorite in the studios park. Once we got off Mummy, we had about 20 minutes before our return time for Jimmy Fallon, so we did a ride on Transformers The Ride 3D (identical to California's...a very good ride, but not quite top tier IMO), then it was time for a Race Through New York Starring Jimmy Fallon. When this attraction was announced, I wasn't a fan of the idea, and nothing I saw changed my opinion. However, I did go in with an open mind. The "queue," if you can call it that, is an attraction in itself, with lots of displays, interactive elements, and even a live show to keep guests entertained. The ride itself, unfortunately, is quite a disappointment. Perhaps it's because I don't watch Jimmy Fallon that much or because I'm not a huge fan of 3D attractions in the first place, but the ride seemed like little more than an advertisement for Fallon's show, with nothing but a stream of references that make no sense to non-viewers. I can see how some might enjoy that, but for me the concept is just too weak to make this a worthwhile attraction. Excluding the Woody Woodpecker kiddie coaster (which I did ride), this one ended up as my least favorite attraction in the studios park. With the front of the park completed, we began to make our way around the lagoon. Opting to travel counter-clockwise, this made our first destination E.T. Adventure. On paper, this ride sounds like a knockoff of Peter Pan's Flight: Guests board flying bicycles and join E.T. on a trip to his home planet. The ride is extremely dated and cheesy, but for whatever reason I found it way more enjoyable than I expected. In addition to being one of the few attractions at the park with practical effects rather than screens, it is also the only remaining attraction from USF's opening year. For those reasons, I really hope it remains for some time to come, and I'm very glad Nintendo will be added without disturbing this attraction. Beyond the outdated Woody Woodpecker Kidzone, we next passed through Springfield, home of the Simpsons. The main attraction here is the Simpsons Ride, a familiar attraction from California that I gave a token ride on a later day of the trip. This day, however, my sights were set on a ride at the far end of the lagoon: Men in Black Alien Attack. When this ride opened, it was met with rave reviews, and even today many still consider it the best interactive attraction ever built. The ride starts with a preshow clearly meant to make fun of Disney's attractions, then guests step aboard a secret elevator to try out for the Men in Black. A long, highly detailed queue (that was never full enough to fully appreciate) leads to the station. Here, the uniqueness of this ride is first revealed...unlike every other shooting dark ride I know of, on this one you are competing against not just your seatmates, but riders on a vehicle running parallel to yours. The ride begins as expected, but then things take a turn when you're thrust into a battle with actual aliens, rendered on full sets with plenty of animatronics. From here, the ride gets more and more intense until it's time to "push the red button" and find out if you got the job or not. Is it the best shooting dark ride ever? As much as I love the new Justice League attraction at Six Flags Magic Mountain, I have to say yes. Men in Black is the most re-rideable attraction at the studios park, and is probably the most purely fun ride at Universal Orlando. I did this one a half dozen times, with at least one ride on each day of my visit. It's just that good. Beyond the World Expo, the waterfront transitions to the settings of San Francisco. Before going that far, however, a small slice of London interrupts your travels. While this facade seems fairly pedestrian, behind it lays the most immersive theme park environment ever built. Welcome...to Diagon Alley! As a rule of thumb, I consider a themed area to be only as good as the attractions it holds. In my opinion, elaborate theming and immersion are very pleasant to look at, but if the area is not anchored by a top notch attraction it isn't somewhere I'm going to spend much time. Part of that may be due to being a ride person, but for the most part I think it's largely that no land can completely erase the feel that you're inside a theme park. Try as they might to provide a truly immersive experience, Cars Land feels off when populated by humans, Pandora feels a bit too manufactured to be an alien planet, and snowy Hogsmede isn't convincing in sunny Southern California. Diagon Alley, however, is an exception to the rule. Walking into this land, I felt as if I had left behind Universal Studios and instead entered a film set open to visitors. Everything on the streets is absolutely perfect, with details replicated to exactly portray the world first seen in 2001. Here, the themed area was an attraction itself, and it was so perfect that on one of my days I spent over an hour wandering the area and checking everything out. If it weren't for the crowds, I could probably have spent several hours looking at everything, but this is by far the most popular section of the entire resort. Of course, Diagon Alley is not without a ride of its own. Here, the signature attraction is Harry Potter and the Escape from Gringotts. Part roller coaster, part dark ride, this attraction draws inspiration from the first act of the final film. It begins with the best queue I've ever seen on a theme park attraction, taking guests through the lobby of Gringotts, into the back offices for a visit with Bill Weasley, and then down an elevator to board a mine cart for a tour. No expense was spared here, with everything detailed to the nth degree. Sadly, the quality didn't carry over to the actual ride, which largely consists of stopping in front of a screen to watch events play out before guests proceed to the next one. Don't get me wrong, it's still a very good ride, but it really could have been so much more. With a bit more to the coaster portions, a few animatronics, and a story that didn't violate established canon (at least not explicitly), this may have been the best ride ever built. As it stands, it is at the lower end of the top tier for me...one I'd absolutely consider a must ride, but not one I crave another spin on (in fact, I didn't even manage one ride per day...it's just not worth the wait times). Beyond London lies the previously mentioned San Francisco area. At the moment, this area is just a couple shops and restaurants. Next year, however, it will be home to the brand new Fast and Furious: Supercharged attraction, a 4D dark ride similar to Skull Island over at the other park. It should be a pretty good ride, though probably not one worth a special trip if you've done Skull Island and/or aren't a fan of the franchise. And...we're now back where we started. While USF is definitely larger than USH, it is by no means a large park. Including all of the backstage area, I'd estimate the park is probably about 80 acres...slightly smaller than the original Disneyland, and smaller than three of WDW's parks by a significant margin. Given that the park only has 18 rides, the size feels appropriate, and it also makes it easy to explore. Universal parks aren't just about the rides, however. USF is full of shows, ranging from small streetmosphere performances to full blown theater productions. Partly due to schedules and partly due to interest, I only took in two of these attractions, both on the last of my four days at the resort. First up, Terminator 2: 3-D Battle Across Time. My trip coincidentally worked out to allow me to catch one final performance of this excellent show in the week prior to its closure. Put bluntly, this is my favorite movie-based theme park show by a significant margin. Not only is the movie itself a great extension of the franchise, but the inclusion of live actors and clever use of in-theater effects adds another dimension to the performance that a standard 3D/4D theater can't quite capture. It feels like the action is truly taking place around the audience, not like you're just watching a movie. I may be slightly biased as Terminator 2 is one of my all-time favorite movies (fun fact...seeing this show at USH is what prompted me to watch the Terminator films), but even without that it's an excellent show that will be missed. The other show I watched was the Universal Horror Make-Up Show. An expansion of the old special effects stages in California, this show is 30 minutes of watching a horror movie artist do his thing. The show is a bit heavier on the film examples and lighter on actual demonstrations than I'd like, but it is still a highly entertaining show thanks to the antics of the hosts. It's not something worth repeat viewings, but it's well worth one watch, particularly for anyone who has ever wondered what goes on behind the scenes in order to make everything work on camera. With that, it's now time to head back to London and board the Hogwarts Express to Hogsmeade. I'll give an overall summary of the park at the end, but for now I'll say this...Universal Studios Florida is undoubtedly better than Universal Studios Hollywood. Unlike the latter, it feels like a complete full-day park. That said, it is not a top tier park on its own. Before I get into the other park, I just want to take a moment to talk about the Hogwarts Express. I know some people who absolutely love this attraction, and I know others who view it as nothing more than a fancy way to travel between parks. I look at it like this...the Hogwarts Express is a full themed attraction the first time you ride it, and everyone should try it at least once. After that, however, it loses its appeal as an attraction and is only really useful if you're trying to get from one park to the other. The effect isn't quite convincing enough to be fully believable, and with the same show playing on each ride (there's a different show for each direction), it's not that repeatable as a ride. So, is it worth buying a park-to-park ticket just for this ride? Absolutely not. However, if you buy a park-to-park ticket, should you ride this? Absolutely. Should you buy a park-to-park ticket? That depends on a few factors, and I'll discuss that later. As mentioned, Islands of Adventure was the hot topic when I was just discovering the theme park fan community, and when it opened in 1999 it featured some of the most amazing rides the world had ever seen. Here, guests could step into familiar worlds and explore them not as viewers, but as occupants. Originally, the park hosted islands themed to Marvel comics, classic cartoons, Jurassic Park, mythology, and Dr. Seuss. Today, Harry Potter and King Kong have joined the circle, each with their own exclusive areas. Unlike the studios park, Islands of Adventure dispenses with the idea that guests are "riding the movies" and instead goes with the idea that the movies are real. There's no studio set show here...it's all portrayed as a real location. On my first visit to this park, I arrived via Hogsmeade around 1 P.M. Despite the fact that this area exists in California, I still took the time to ride Harry Potter and the Forbidden Journey (still one of the best dark rides out there, and much better than Gringotts IMO) and Flight of the Hippogriff (it's a credit...what can I say). But my main target in this area was a legendary beast that had resided here since opening day...or, to be more accurate, a pair of them. Some may call it Dragon Challenge, but to many it goes by a different name. If you've been following along with this trip report, you'll recall that my trip occurred on September 24th to October 4th. If you've been following what goes on in Florida, you'll also recall that Dragon Challenge closed for good on September 4th. So, how is this possible? Did I find a way to travel back in time? Is that a fake photo, or one I didn't take? No, the answer is must simpler than that. It is at this point that I must confess I have not been entirely truthful. While the dates of my trip are accurate, my first visit to Universal Orlando actually occurred over a month before on Friday, August 11th. You see, I'd been hearing rumors for a year or two that Dragon Challenge likely did not have long to live, and I wanted to make sure to get to Florida before it went away forever. When the rumors intensified in early 2017, I decided that no matter what it would be the year I'd finally do a Florida trip. Originally, I was planning to go in the spring, but for a variety of reasons a fall trip made more sense. My hunch was that Dragon Challenge would close following the conclusion of the Halloween season, so I planned my trip around that. Unfortunately, once planning was about 80% complete, the announcement dropped...I'd be missing the ride by just a few weeks. That night, I started searching for a way to get to Universal before the ride closed, and as luck would have it a solution presented itself. Andrew happens to work for Frontier Airlines, and he generously offered to fly me out to Florida on a buddy pass and show me around for a day. Therefore, I did what many would consider crazy...fly overnight from California to Florida, spend a day at Universal Orlando, sleep, and then fly home the next morning. But why do this for a single attraction, especially one that is just a B&M Inverted coaster? I've ridden over a dozen of those. Well...Dueling Dragons is very likely the reason I joined the enthusiast community, as it was the first attraction I saw that made me want to travel to theme parks beyond California. 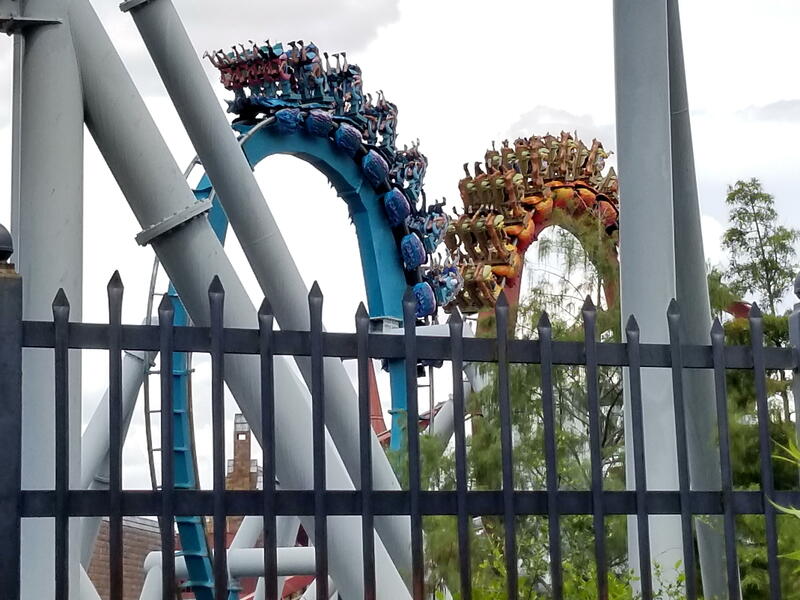 Sadly, I was unable to get any good photos of the ride due to Universal's locker policy, so here's a link to RCDB's photo album:Dragon Challenge. So, was the ride worth the trip? I'm going to be brutally honest...yes and no. It was so meaningful to me that I got a chance to ride that coaster, as it is one I'd wanted to try for 18 years. However, without the dueling aspect that the ride was designed to have, it was little more than a pair of fairly average inverted coasters. By anyone's definition, the coaster was a good ride, but among the B&Ms of Florida it was probably my least favorite, and among the major attractions at Universal Orlando it was probably the least unique. Now, in the ride's original incarnation, I fully believe it was one of the best coaster experiences ever built. With the original highly themed queue and a course that sent two trains of riders within a foot or so of each other at full speed, it was definitely one of a kind. Sadly, the lack of common sense among theme park guests killed the dueling aspect, and Harry Potter killed the theme, leaving the coaster as a pair of inverts slightly better than a Batman clone. On that day, I rode each track twice...for me, that was enough. Unlike some coaster enthusiasts, I do not hate Universal for removing the ride...by the day it closed, it was a diminished experience that didn't fit well within the park. However, it's sad that many of the more unique rides are giving way for rides differentiated largely by the featured IP than by what they are capable of. This applies across the board, not just to roller coasters, and is as much a problem at Disney and Universal as it is at Six Flags or Cedar Fair. While I'm not holding my breath, perhaps there will be a day in the future where a new form of the Dragons will rise. Only time will tell. By the time we finished exploring Hogsmeade, it was approaching 2 P.M. and we were ready for lunch. Naturally, the Three Broomsticks came up as a suggestion, but I've been there several times in California. Therefore, we opted to venture a short distance into the Lost Continent, where we found a former winner of Theme Park Insider's "Best Theme Park Restaurant" award. Unlike Disney, I did not do much research on dining prior to visiting Universal Orlando. However, Mythos was one restaurant I knew was a must visit. From the outside, the architecture is excellent, fitting in with the ancient Mediterranean look of the Lost Continent. Inside, a maze of passageways and caverns leads to a large dining area with impeccable detail on every surface. While it lacks the story aspect found in Disney's restaurants, Mythos may be the best themed restaurant as far as atmosphere is concerned. While I don't know that I'd say the food itself is the best ever, it is definitely in the upper tier of theme park dining, and given the very reasonable prices I absolutely recommend a meal here. I actually wound up visiting again on my last Universal day as Evan had never been here before (despite several Florida trips in recent years), and while I got similar things both visits (both burgers/sandwiches...I forget exactly which), I really enjoyed each. Full from lunch, it was time to take in the rest of the Islands. Picking a direction semi-randomly, we headed clockwise and found ourselves in Seuss Landing. Despite the general ridiculousness of the worlds within Dr. Seuss books, Universal rendered the area in three dimensional reality with perfection. Hardly anything is straight here, from buildings that look like they shouldn't stand up to palm trees imported from areas damaged by Hurricane Andrew. Like its source material, Seuss Landing is geared toward the younger set, but the rides are accessible to all. We took a ride on the the High in the Sky Seuss Trolley Train Ride for a nice aerial tour of this section of the park, then headed over to the most bizarre dark ride on Universal property. Of Dr. Seuss's works, The Cat in the Hat is likely one of the most well known. At Islands of Adventure, this classic children's book is adapted as a dark ride through the story. Rendered with full animatronic scenes, virtually everything from the original story is included here. It is, more or less, Universal's take on a Fantasyland dark ride. The attraction itself is entertaining, bizarre, quirky, and a bit dated all at once, but it absolutely something that needs to be seen in person. Beyond Seuss Landing, a brief trip through the Port of Entry leads to Marvel Super Hero Island, the original Marvel theme park land. Rendered to resemble the world of the comics rather than that portrayed in the films, this section of the park is dominated by two-dimensional character cutouts hanging off the side of three-dimensional buildings. Every single character was painted by the original artists of the comic books, with hidden signatures present on each. And, every 90 seconds, a roller coaster roars over, under, and around the area. The Incredible Hulk, a steel monstrosity built by Bolliger & Mabillard, dominates the western side of the area. Unlike most coasters of the time, Hulk begins with a launched lift into a Zero-G Roll over a hundred feet above the walkway below. What follows is an intense series of inversions, helixes, and various twists and turns that doesn't let up until the brake run, all set to a superhero soundtrack. While the original layout was preserved, this coaster was entirely rebuilt a couple years ago, and now provides an exceptionally smooth and forceful ride that is simply incredible. I rode this one twice on each day I spent at the park, and upon reflection I think I have to declare this the best roller coaster in Florida. I've ridden over 400 roller coasters, and this one makes the top 20 of my steel list...it is that good! However, the best theme park attraction in Florida lies at the other end of this island. Tucked into a corner stands the entrance to The Amazing Adventures of Spider-Man, a ride that essentially revolutionized the industry. The attraction begins with a lengthy but highly detailed queue line passing through the offices of the Daily Bugle. Here, J. Jonah Jameson assigns guests to team SCOOP in order to cover a story about super villains taking over the city. The ride itself is essentially a motion simulator on a track, much like Transformers. However, this attraction combines 3D sets, physical props, and special effects in just the right proportion that it feels like you're part of the action rather than watching it play out. The storyline is outstanding, the scenes within are excellent, and the length of this ride is just right. It is perfection...the single best theme park attraction I've ever experienced, and one of only three dark rides I would award a 10/10 to (the others are Harry Potter and the Forbidden Journey and Indiana Jones Adventure). At this point, my phone batter was pretty low, so I stopped taking pictures and never thought to get some on later days. Images of Toon Lagoon, Skull Island, and Jurassic Park can be readily found via Google. Continuing beyond Marvel Super Hero Island leads to Toon Lagoon, the most dated section of Islands of Adventure. Based on classic but largely forgotten cartoons, this section of the park is all about getting guests wet. It is possible to drench yourself just walking down the pathway, and if you can escape that the two rides will show you no mercy. First up, Dudley Do-Right's Ripsaw Falls. In general, log flumes are on the more moderate end of water ride wetness. This thing, however, is not a typical log flume, and it has more in common with a water coaster. The ride features three drops, each increasing in size and soak factor, with scenes depicting Dudley Do-Right's attempts to rescue Nell Fenwick from Snidely Whiplash. As someone who has little familiarity with the source material, the story didn't make a whole lot of sense. However, it is the finale of this attraction that makes it well known: a seven story plunge drops riders seemingly underwater, then they cascade into a pond with a big enough splash to soak riders to the skin. As much as I like log flumes, I have to say that this ride slightly disappointed me. Due to substantial negative forces, this ride uses lapbars, which make the small logs fairly tight. Additionally, it just didn't have a whole lot going for it other than the three drops. I am likely spoiled by having two of the best log flumes ever built (Splash Mountain and the Timber Mountain Log Ride) at my home parks, but while I really enjoyed Dudley Do-Right I didn't feel the need for another ride later in my visit. Across the walkway is Popeye and Bluto's Bilge-Rat Barges, a river rafting ride that redefines the term "wet." While there is general Popeye theming around the area, this ride is definitely more about the water, with the theming serving as atmosphere rather than heavy storytelling. Now, I don't generally seek out particularly wet rides, but I do enjoy river rapids attractions and don't mind an "above average" amount of wetness if the ride is good. I was warned by Andrew and Brittney (who both stayed far away) that this was the wettest ride in the world, but I boarded thinking "How wet can you possibly get?" About a minute into that ride, I reached that point...and there was still five minutes of ride left. Then, the rafts reached the lift, and on most river rapids rides this signals the end of the ride. Here, however, the lift drops rafts into a swirling vortex of turbulence that ensures you will carry as much water as humanly possible away from the attraction. I seriously think I would have been dryer if I had jumped into a swimming pool with my clothes on. This ride was totally awesome...easily the best of its type that I've experienced. It is also probably a one-time ride, as it (combined with Dudley Do-Right) destroyed the clothes I was wearing that day. While we're talking about water rides, IOA's third can be found a bit further in. Located in the Jurassic Park section (which also features Camp Jurassic, one of the best theme park playgrounds I've ever seen) is the Jurassic Park River Adventure. Much like the similar Jurassic Park - The Ride in at USH, this is a boat ride through a series of dinosaur enclosures. Naturally, something goes terribly wrong, bringing guests into a restricted area and putting them face to face with a T-Rex before an escape down an 85 ft plunge. I've always really liked this ride, and while I do have a slight preference for the California version (it seems to have more animatronics), both versions are top notch water rides. Sandwiched between Toon Lagoon and Jurassic Park is the newest attraction at Islands of Adventure: Skull Island: Reign of Kong. This attraction begins with a very elaborate queue, winding through ancient structures once inhabited by natives. Eventually, guests enter a room featuring a very impressive animatronic and several other effects. The corridor beyond contains live actors similar to those that would be found in a haunt maze, then the queue winds through a couple more detailed caverns (with a few more smaller animatronics) before guests board the ride vehicles. Sadly, the ride itself is a bit of a letdown...it is little more than a couple show scenes on screens followed by a brief encounter with an animatronic King Kong. Many of Universal's more recent attractions feature a queue that is better than the ride itself, and sadly that is the case here. It's not a bad ride, but it consistently held the longest wait at the park and two rides over four days was enough for me. Continuing beyond returns to Hogsmeade, and thus we've completed a lap of the park. To me, IOA felt slightly larger than USF, though I believe both parks are roughly the same size. However, IOA is definitely more about rides, which makes touring it quicker. It is a full day park, but not a multi-day park on its own. So, which Universal Orlando park is superior? While there is definitely room for disagreement, I much preferred Islands of Adventure. Not only does that park beat USF for attractions (both quality and quantity), I felt that the theming was much better throughout. Islands of Adventure contains a bunch of unrelated islands, but each is themed extremely well on its own. On the other hand, while Diagon Alley beats the theming of any island, the rest of the studios park has small themed areas around attractions but few areas with a significant overall theme. Yes, part of the park does resemble sets you'd see on a movie backlot, and while that's not bad it isn't particularly immersive. There is one other issue I take with the studios park...unlike Islands of Adventure, very little remains from the earlier days of the park. While I am a fan of change, it is also important for a park to have a distinct identity. If attractions are constantly being replaced, the park loses that identity and becomes a "flavor of the decade" park. That makes it impossible to return years later and experience old favorites, as they've been retired to make way for new attractions that may or may not be as good. One of the big debates I've seen with Florida trip planning is how much time should be spent at Disney and how much at Universal. Honestly, this question largely depends on how into Disney you are. If you simply look at the Disney parks as any other theme park and go more for the big rides rather than the overall experience, it is entirely possible to do all four Walt Disney World parks in four days (you could probably squeeze them into three days, but I don't recommend that). For a Disney fanatic, however, you could easily spend 6-8 days at the Walt Disney World parks in a single trip and not run out of things to do. Universal, on the other hand, requires a lot less time. It's not too difficult to see the highlights of both parks in a single day, and you can get to pretty much every attraction in both parks in two days. In fact, I'd only recommend doing a third day at the resort if A. You're visiting during a busy weekend, B. You're not staying at a hotel that includes Universal Express, and C. You can't do full days in the parks. In my honest opinion, there isn't enough between the two parks for three full days unless you want a ton of re-rides, and there isn't enough for more than three days (I found myself getting a little tired of re-rides on the fourth day). Therefore, for a first time visitor to Orlando, I'd recommend a 5-2 split (5 days at Disney, 2 at Universal), with more time at Disney if you have more days in your trip. The other big question regarding visiting Universal is whether or not to buy a Park-to-Park ticket. For Walt Disney World, I'd almost never recommend a Park Hopper for first time visitors, as each park has at least enough attractions for 2/3 of a day if you've never visited and traveling between parks can be a nuisance. Universal Orlando, on the other hand, contains two parks literally right next to each other, and it takes only 10-15 minutes to get from one park to the other. On every day of my visit, I ended up spending time in both parks, and on one day I ended up switching parks twice (IOA, USF, and back to IOA). Like Disneyland in California, it is possible to treat the whole property as one giant park, but both do maintain their separate identities. But that doesn't mean everybody should get a Park-to-Park ticket. If you are visiting Universal Orlando for exactly two days and don't particularly care about experiencing the Hogwarts Express, I recommend forgoing the Park-to-Park option in order to save money and to force yourself to fully enjoy the parks rather than being tempted to rush because you want to do something across the resort. For most other combinations, however, I'd definitely recommend Park-to-Park if you plan to visit both parks, as it allows you to add a bit more variety to your day rather than doing primarily thrill rides or primarily simulators and shows. Plus, it is the only way to get the full Harry Potter experience. Connecting the two Universal Parks (as well as the parking structures) is CityWalk, a large outdoor mall full of retail and dining opportunities. I ended up coming out here for a majority of my meals at the resort, as the food is better than what can be found inside the park (at least for the most part). I won't go into detail, but there is one place I must talk about: Toothsome Chocolate Emporium. While some restaurants have decorated facades, this is the first I've found where the facade completely drew me in. From the outside, it looks like a steampunk version of Willy Wonka's chocolate factory, and the theme is continued inside through decorations scattered throughout. In addition, interactive characters wander the dining area, so there's a good chance you'll be visited by the mechanical proprietors while you enjoy your meal. The idea here is that chocolate is used in some way in every item on the menu, and while it may sound odd it totally works. As much as I liked Mythos, I crown this place the best restaurant at Universal Orlando, and highly, highly recommend a visit here. Lastly, while they are a bit pricey, don't pass up the dessert either...the shake I had was so good, I went back for another on my final day at the resort. It was an excellent way to end my time at Universal Orlando. In the end, I enjoyed Universal Orlando a lot. Islands of Adventure is probably my single favorite Florida park, and while I was a tad underwhelmed by the Studios park it was still very enjoyable to visit. The future is certain to be interesting for this place, and I look forward to another visit the next time I'm in Florida. I'll end with this...If I only had one day to spend at a theme park in Florida, this is where I'd spend it. Yeah, I've seen some wet water rides before. But Popeye is the only one where the park has "heating booths" set up outside for people to dry off in. SOAKED to the skin on that thing so while fun, not my "Must-ride" again list. Then again, Universal can get you wet a lot. Jurassic Park got my shirt so soaked, needed to buy a new one right off. Still, amazing experience at both parks and astounding how great they are. A fantastic review! I agree -- if I had only a day in Orlando, I'd be at Islands of Adventure. One thing -- I always consider the tiny amount of space Universal had for creating Fallon and Kong. I think, considering the constraints, they are fantastic experiences. Montu is thecoaster that got me started in my roller coaster addiction. Despite living in SC, I’ve been a passholders at Busch Gardens since 2000. I also like IOA better, but I’m biased towards coasters. Diagon Alley is amazing, though. Great review. Thanks for taking the time to share. Looks like you skipped One Fish Two Fish.... This is a damn fun kids ride that I refuse to miss when in IOA. We enjoy Universal and it is our favorite place to visit. I totally agree. They should have called it "Shake, Rattle and Roll"
Interesting that we disagree on which was the better park. I thought IoA's theming, once you take Hogsmede out of the equation, was in line with a top tier regional park, rather than the studios, or Disney. Mike, I surprisingly didn't get too wet on Jurassic Park (granted, I was already dripping from the Dudley & Popeye combo, so perhaps I didn't notice). I do think Universal has too many rides with water elements, though it's probably hard to pull off a convincing 4D effect without it. DB, Islands of Adventure would probably be my choice for a single day too (or a combo day between both parks). I also have to disagree with you, at least on Kong...it takes up more space than Forbidden Journey or Indiana Jones Adventure, both of which are far superior, so it really should have had more to it. Fallon I dislike more because I don't have a particular interest in Jimmy Fallon than because it is just a motion simulator. Makorider, having ridden over 400 roller coasters, I think part of what I like about Incredible Hulk is that it is unique. Kumba, for example, is a really good coaster, but it isn't all that different from most big B&M rides. Meanwhile, Hulk has a launch and a very different layout, along with more intensity and a smoother ride than most similar coasters. I will say that Montu comes really close to beating it out, as does at least one coaster at SeaWorld Orlando (you'll have to wait for that review to find out which). Tracy, I agree. Diagon Alley is the single best area of any park I've ever visited, but unfortunately it is the outlier among the sections of the Studios park. While the theming isn't bad, Islands of Adventure feels significantly more immersive as a whole, and I think they've got a better attraction line-up as well. It's a shame that they've only got one big roller coaster left, however. Brian, unfortunately I did miss that. I generally don't do flat rides at non-local parks unless they are something I've never seen before, but I'll make a note to try that next time I visit. It looked a bit more interesting than a traditional Dumbo-type spinner. Chad, I think it is largely that I thought the Studios park had pockets of greatness scattered among good, but not great theming while I found Islands of Adventure's theming to be very good throughout (though not necessarily mind-blowing), and I personally prefer the latter. Perhaps I'm a bit more lenient since most regional US parks are utterly devoid of theming. It also could be simply due to enjoying the rides at IOA more...other than Mummy and MIB, most of the Studios rides I didn't feel a need to reride and generally did simply due to visiting with different people on different days. Meanwhile, I thought every top tier ride at IOA was worth multiple rides, and a few of them I could have easily ridden more than I did.